I hope your week started great. I officially don't work on Mondays so mine starts a little later. That said I have to prepare all the time for the rest of the days so this is just a theoretical definition. Today I found out that my salary was messed up for a few months now is still not properly compensated as promised. Instead of getting angry, I chose to shop a few Boys from Tom Ford, hah, what a nice thing to do especially if you don't have money! I have been testing Clinique's brand new Smart Series for over a month now for every day so I thought I will share my thoughts with you today on these. Clinique Germany was also very generous to offer a give-away for my readers which I will set as a separate post during this week. Separate give-away posts are great to hide after the offer is over. I have a bunch of give-aways in December, hoping that you will like them. 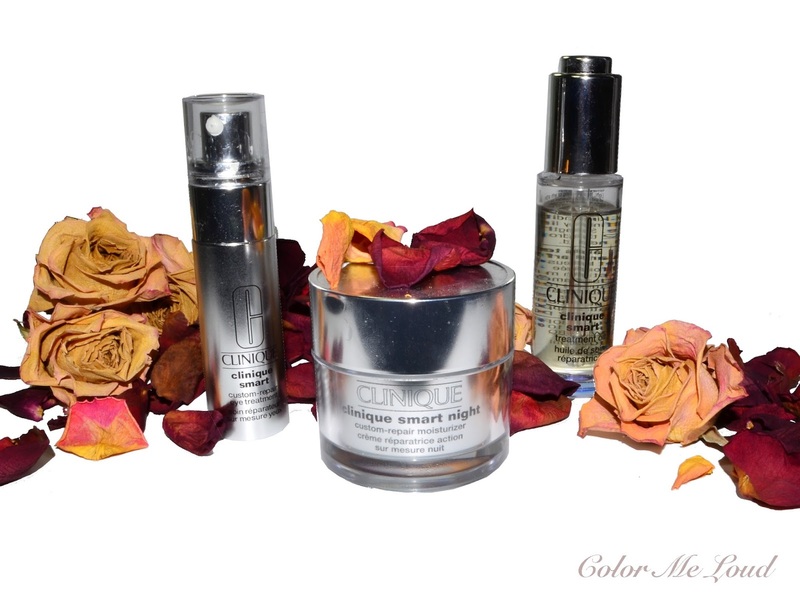 I have been testing Clinique Smart Night Custom Repair Moisturizer, Clinique Smart Treatment Oil and Clinique Custom Repair Eye Treatment. Smart series also offers a day cream and a serum called Custom-Repair Serum. 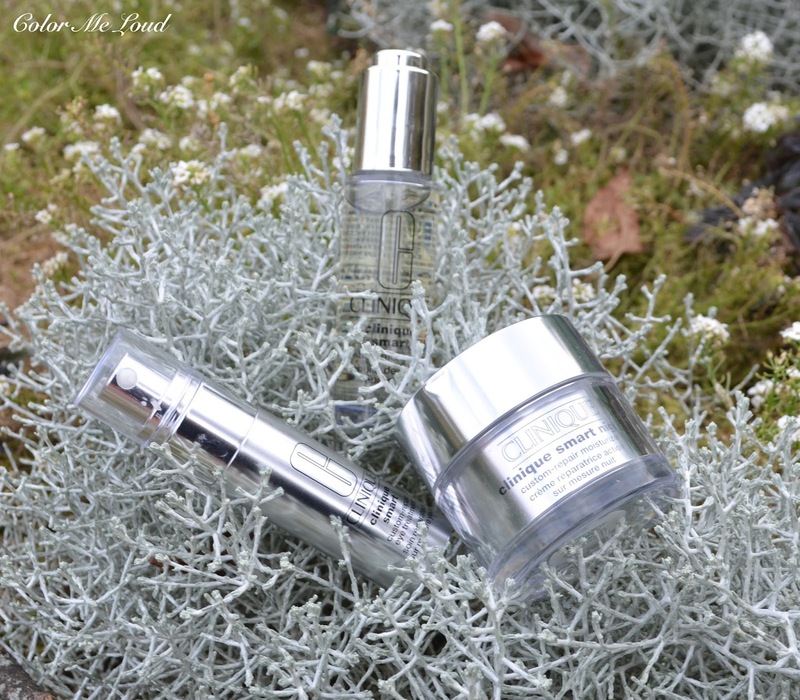 Day and Night Creams come in three different richness levels, which is great to meet your own needs. There is one for dry skin (number one), one for normal (number two) and one for combination to oily skin (number three). Clinique has a number system, you can check online which products are best for you by answering a few questions. I am usually between normal and dry, depending on the time of the year. Since right now it is winter and my skin needs more care, I decided to go with Clinique Smart Night Custom Repair Moisturizer for dry skin. Smart Night Custom Repair Moisturizer is oil free, fragrance free and given to include Micrococcus Luteus Enzymes which detects and repairs skin damages. I don't have a box of the press sample so I unfortunately can't provide you with a full list of ingredients. It feels like a rich cream but it is not thick so it can nicely be distributed to the skin as a very thin layer or thicker if needed. It gives my face healthy and nourished feeling. The cream is absorbed quickly and leaves a nice sheen on the skin so too bad it is just for night, I would totally use it under my foundation for some more glow. (maybe I should!). The smart series are given to be multi tasking products which can target wrinkles, brightens, firms and gives radiance. It is hard to test all these claims but it definitely gives a firmer feel and more radiance to me over the last weeks. As a dehyrated-skin-gal though, I need a moisturizer combined to this one to wake up with a good hydration. I was very curious about Clinique Treatment Oil because I have been testing lots of facial polls lately, including Sisley Black Rose (reviewed here), La Mer Renewal Oil (reviewed here) and Clarins Blue Orchid (reviewed here). Clinique Treatment Oil is definitely one of the thicker consistencies I have tried so far so I am loving this one at night under Smart Night Custom Repair Moisturizer. It can be nicely distributed on the face and absorbed quickly. I wished I had an ingredients list of this one. It is said to contain a good deal of antioxidants and plant oils. The best thing about this is that it is fragrance free and smells neutral so if you can't stand the scent of some of the facial oils, this might be your chance to love facial oils again. The packaging is really nice, much better than some of the more expensive oils out there, the pump is very close to the one of La Mer! Definitely a great option for its price if you are in search of a good facial oil to use at night. I kept my favorite for the last, Clinique Custom Repair Eye Treatment is killing it in such a good way! Since I have fallen in love with La Mer Illuminating Eye Gel (reviewed here), I have been searching for a more affordable option. Clinique Custom Repair Eye Treatment comes with a one way hygienic pump. I apply one pump of this on my finger and warm it up between my towering fingers then tap it under my eyes. It quickly gives a refreshing and hydrating feel. One pump is enough for both of the eyes. The best thing about this is that it absorbed relatively quickly so that I can apply it under my under eye concealer and it doesn't move the way it does with La Mer Illuminating Eye Gel, which has a more long lasting effect but in the morning all I care for is the speed. Yes loving this one so much, definitely check it out if you are an eye cream/gel junkie as I am. Oh and yes, the consistency is between gel and cream. Big love, insert an heart here! Final thoughts: Clinique definitely upped their game on skincare front with their new Smart Series. I am loving the fact that these are available for three different skin types and almost all the products I have tried are great value for the price. My absolute favorite out of three is Custom Repair Eye Treatment which I can't live without at the moment, be it under the concealer or for night. Treatment Oil is great to nourish the face and neck over night but it is a little thick for the day time usage. Smart Night Custom Repair has a great consistency which is not too thick but still very nourishing. Which eye cream/gel are you loving at the moment? Have you tried any of these products? I'm actually looking for a good eye cream recommendations. In last three month, due to untold amount of stress, my under eye area just fell apart. I aged about five years in those three months. My skin will drink up any amount of moisturiser but then my eyes get puffy. I've been using EL ANR serum, Dr Somchai (used to be my favorite) but can't see any results. Hahaa you did the best move Sara!i almost was left without any money from my huge Tom Ford Black Friday haul since the Noir Holiday collection(got the duo the eyeliner and blackout nail polish) was launched at the same time with the boys :) Which boys did you pick? I picked Vladimir,Egon,Drake,Joaquin,Eddie,Malik,Ansel and Jake and then next is Daniel, Theo Eric and Rocco! For the eyes for the past two months I've been using All about eyes rich from Clinique along with Clinique serum de puffing and I'm really satisfied with the results! I heard good words about another one from this works brand perfect eyes recovery cream with cucumber so maybe this will be my next try ! OK, you got me at the eye treatment. I need to check this out! I'm a sucker for eye creams. I love the La Mer one, but it's just so expensive. I went back to my Estee Lauder ANR Eye and it's been doing its job. Still, I always stray. HAHAHA! I have a sample of the Eye Treatment, now I really want to try it! 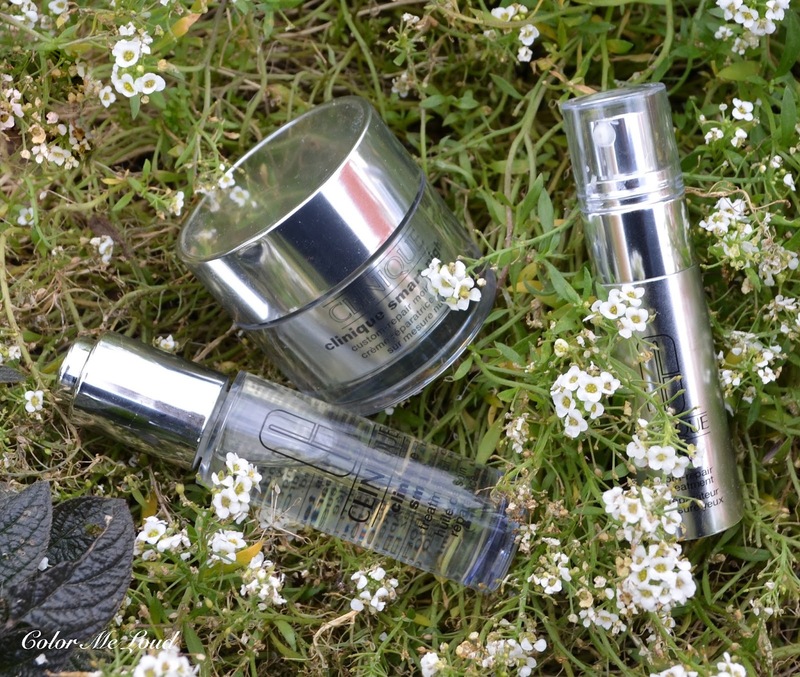 I haven't tested any product from the Smart series yet, in fact I haven't had much luck with Clinique skincare in the past. But I'm intrigued by this new line and want to give it a try.